Perhaps because of its high cost, Tuberose (Polianthes tuberosa) is often neglected in aromatherapy catalogues, but its fantastic deep, rich fragrance deserves attention. Related to the Narcissus and Jonquil, with no reference to Rose whatsoever, it resembles the Lily and members of the Freesia family, and is native/indigenous to Central America, where it is found growing wild. It belongs in the Family Amaryllidaceae. 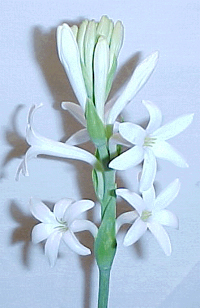 History: The tuberose is one of the earliest cultivated plants, and may be extinct in its natural habitat. The Aztecs were growing it nearly 600 years ago. The Spanish found the Aztecs growing it in 1519 and took it back with them to the Old World. A French missionary, returning from the Indies in the 1500's did so as well. Once introduced to Europe, it became part of the moon garden, a collection of white or pastel flowers, which release an intense fragrance after dusk. These gardens were popular among the sun-shunning Victorian ladies, who valued a milky pale complexion. The plant did fall out of favor when it became much overused at funerals. It has an intense fragrance, and one or two open blossoms will fill the air of an entire garden. Growing Conditions: The tuberose likes hot sun, and loose, rich, moist soil. It is recommended that northern growers start them in pots four to six weeks before the last frost date and move them outdoors when the nights warm into the 60's. If the summer is short, the pots may have to be brought in to a sunny windowsill. Bulbs take about 3 months to produce flowers, which occur over several weeks. Bulbs can be left in their pots, or dug up and stored, in a dry place and over-wintered. The parent bulb will form daughter bulbs and once these are thumb size, they can be grown next season. This tall slender perennial which is up to 3 feet in height with its long leaves, a tuberous root and long flower stems whose flower buds will open 2 and 3 at a time over the course of a week. In cultivation, the bulb has to be replanted every several years in clean pots and new potting soil. In my experience here in San Francisco, bulbs need to be planted in a sheltered greenhouse, with 12 hours of sunlight each day and good circulating air from beneath, but no wind. After the flowers are harvested, the leaves are allowed to die down, and the pots are put in a dark place until the Spring Equinox. The Tuberose flower is one of the flowers that continue to produce and exhale perfume long after it has been picked. It takes 3,600 kilos of individually handpicked blossoms to produce one kilo of absolute from concrète. No wonder it is so expensive! As Steffen Arctander describes it, the Tuberose aroma is a "heavy floral, almost nauseatingly sweet, [with a] heavy and somewhat spicy odor, reminiscent of Honeysuckle, Peru balsam, Orange flower absolute and Stephanotis flowers". Perfumers used to press the flowers onto cleaned tallow spread on glass sheets to make a much sought-after perfume material. This method is called enfleurage. The absolute is a dark, red-amber with a floral, earthy fatty scent. Harvest: Christopher McMahon reports the following on his witnessing of a Tuberose harvest in India: "We picked up the flower purchasing agent in a nearby village and once again headed down obscure country lanes to farms which he knew. As the sun rose, we were on location to see the members of one farming family plucking individual buds of Tuberose at the proper stage for extraction. Tuberose is harvested throughout the year here, but its main season is October-November. A one-acre parcel will yield about 25 pounds of buds daily during the height of the growing season and less than half that at other times of the year. Companies will contract with the farmer through the flower agent to purchase the entire harvest (able) crop during this time of year. As most plots of land dedicated to such crops are small, this must be carefully organized, as a total of 1000 lbs. or more must be procured on any one day to make extraction feasible. This means that transport tractors to obtain the proper amount of flowers must visit many sites. Then, as with any of the delicate flowers, the picked buds must reach the factory swiftly so that the extraction process can begin as soon after harvest as possible - otherwise the aromatic principles inherent in the flower may be altered or lost." Commercially, if flowers are field grown, the bulbs are dug up in November, stored over the winter in airy, dry places, and in the spring, they are separated and replanted out in April. Preparation: Extraction is done by enfleurage as with many thick-leafed flowers, the natural scent continues to develop for up to 24 hours after they have been harvested. In modern times, extraction is done strictly by solvent extraction to produce a concrete and absolute of Tuberose. It is one of the most expensive and valuable fragrances that are known. In addition, Tuberose flower wax is produced which is an excellent skin care product but is difficult to find. The Tuberose flower wax is a worthwhile addition to products as it is a moisturizer, free radicals scavenger and has emollient action. Use it in products at .5-5% range. Enfleurage: Freshly picked flowers, closed, are placed on the chassis that is clean tallow. They are kept for 48 hours where they continue to exhale their perfume into the fat. Then new flowers replace them. One kg. of the corps is treated with 3 kg of flowers. Approximately 150 kg of flowers yield 1 kg of absolute of enfleurage. The residual flowers, when removed from the chassis, still contain some natural and developing flower oil. These residual flowers are submitted to extraction with petroleum ether and this yields the so-called absolute of chassis. Properties and Indications: In general Tuberose scent is considered to be narcotic and aphrodisiacal. It is indicated for impotency and frigidity and to induce relaxation. It is used mainly by inhalation. The absolute is wonderful in expensive perfumery. The scent can also be used in small amounts to flavor sweets or 1 drop in a bottle of moderate priced champagne can create a powerful aphrodisiac for two people. What to Buy: The most readily available forms of Tuberose today, are the "Mexican Single", which has 6 waxy white petals, and "The Pearl", (formally called "The Excelsior") a double, that is sometimes called a miniature gardenia. Both produce around 30 flowers, a few at a time, from a 3-inch stem that grows from a grassy clump. The "Mexican Single" is more fragrant, and is not as likely to need staking. 1.Logee's Greenhouses for Night Blooming Cereus and Tuberose. 888/330-8038; www.logees.com. 2. Old-House Gardens for Tuberose. 734/995-1486; www.oldhousegardens.com. Rose, Jeanne. 375 Essential Oils and Hydrosols. Frog Ltd. 1999.